Published: Faber, 1977. ISBN 0 571 11118 1 [hardback; pp.199]. The Faber cover is by Paul Nash: “Landscape, West Dorset”. (A Dream of Wessex was last published in pb by Earthlight  as “Omnibus 1”, together with The Space Machine.) Also available in translation. US title: The Perfect Lover. Said by some to pre-figure Christopher Nolan’s film Inception by more than three decades, this was the novel that showed CP’s novels evolving from relatively conventional science fiction into the more complex and challenging later works. 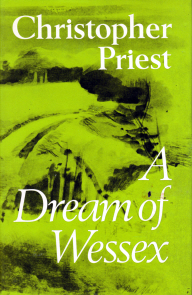 A Dream of Wessex can be read as a straightforward story about a group of present-day dreamers who create a consensus virtual reality future. Once they enter their imaginary world they are unable to remember who they are, or where they are from. On another level, the novel is itself an extended metaphor for the way in which extrapolated futures are created.